The Feast of the Infant of Prague is the same day as The Holy Name of Jesus, January 14. Few novenas promise the instantaneous results of those to the Infant of Prague. It necessitates a suspension of all doubt as it is completed in one day over a nine—hour time span. Perhaps the most invoked aspect of Christ in the world, this novena promises that anything is possible for those who believe. Christ is presented as both a kindly child and a king. The Infant of Prague is a statue of the child Jesus dressed in actual clothing. Instead of the modest garments of a poor child, he is wearing the sumptuous gown of royalty. 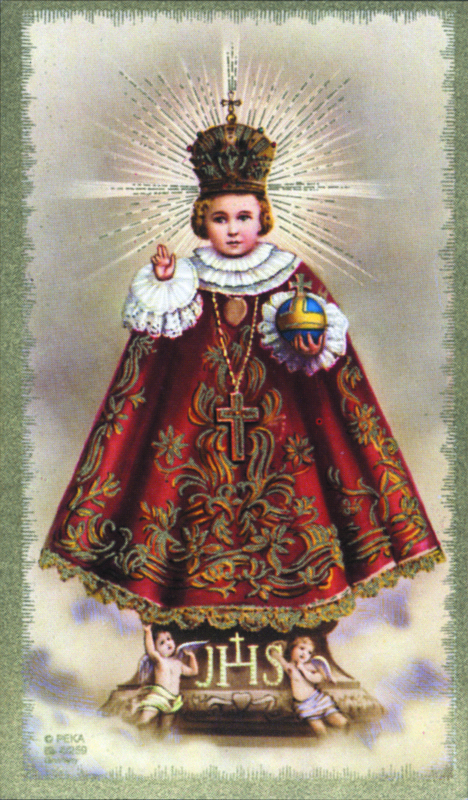 Because the Infant of Prague looks like a little doll, we are welcome to approach him with the open faith of a child. Reflecting the faith of Jesus, the novena requires an intensity of devotion. Many people have a version of this statue in their homes, as it is said to guarantee abundance. This novena, frequently utilized by those in financial difficulties, can be said during any desperate situation. The Divine Child, a nineteen—inch wax sculpture, was brought to Prague, Czechoslovakia, by a Spanish princess who received it from her mother as a wedding gift. She in turn, bequeathed it to her daughter, Princess Polyxena. On becoming a widow in 1623, Polyxena decided to devote the rest of her life to doing charitable works. The extremely poor order of Carmelite monks of Prague were her favorite beneficiaries. Bringing the statue, she promised, “As long as you will venerate this image, you will not lack anything.” The statue of the Divine Child was installed in the chapel, and the monks became aware of an immediate change in their material and spiritual fortunes. In 1631 the monks had to flee their monastery because of an invasion by Sweden. In the ensuing confusion the statue was left behind, only to be thrown on a trash heap by the invading army. Miraculously, it was found seven years later by a priest named Father Cyril, who had been particularly devoted to the Divine Infant. Though it was made of wax, the only damage sustained by the statue was its missing hands. Devotions to the Divine Infant, returned to its altar in the chapel as the once again poverty—stricken Carmelites began to rebuild their monastery, were revived with great fervor. While Father Cyril was praying before the statue, he heard the words: “Have pity on me and I will have pity on you. Give me my hands and I will give you peace.” Though money came to the order, it was felt that it should be put to use for more important causes than the repair of a statue. Again Father Cyril heard a voice while in prayer: “Place me near the entrance of the sacristy and you will receive aid.” A passing stranger, seeing the broken statue, offered to have it repaired. When the Divine Infant seemed to be responsible for several cures during an epidemic, the priests moved the statue to the main church so that the public could also benefit from its graces. In 1642 Baroness Benigna von Lopkowitz had a beautiful chapel built for the Divine Infant, where it remains to this day. Many make pilgrimages to Prague to see the original little statue that has inspired so many copies around the world. Divine Infant of Prague, dearest Jesus, you who so lovingly said, “Ask and it shall be given you; seek and you shall find; knock and it shall be opened to you,” have mercy on me now, and through the intercession of our most holy Mother, I humbly ask you to grant me the grace I need. Mention your request Divine Infant of Prague, dearest Jesus, you who so compassionately taught, “If you can believe, all things are possible to him who believes,” have pity on me now. I do believe; help me. Increase my weak faith through the Blessed Mother’s intercession. I humbly ask you to answer my request. Mention your request Divine Infant of Prague, dearest Jesus, you who once said to the Apostles: “If you have faith like a mustard seed, you will say to the mulberry tree, ‘Be uprooted and be planted in the sea,’ and it will obey you.” Hear my prayer, I humbly ask. Through the intercession of Mary most holy, I feel certain that my prayer will be answered. Mention your request. Because this novena is said for those in great distress or emergency situations, it is completed in one day. Say this novena nine times in a row at the same time every hour for nine consecutive hours. This entry was posted in Babies, Children, Grace, Love, Novena, Prayer, Saints, The Virgin Mary and tagged Infant, Jesus, Novena, prayer by sandra dipasqua. Bookmark the permalink.